The larger than life bronze Buddy Holly Statue, sculpted by Grant Speed of Utah, and originally located in front of the Lubbock Civic Center on Avenue Q, was dedicated on September 5, 1980. Those primarily responsible for it were Larry Corbin (of KLLL Radio), Jerry Coleman (of KLLL Radio), and entertainer Waylon Jennings. The Buddy Holly Walk Of Fame (also known as the West Texas Walk Of Fame) is a series of plaques mounted at the base of the Buddy Holly Statue when it was located at the Lubbock Civic Center, honoring those people from the area who were known nationally or internationally and brought prominence to Lubbock in the music and entertainment fields. When the statue was first unveiled, the large plaque for Buddy Holly was already in place. The first inductee then was Waylon Jennings. Some of the other inductees through the years included Roy Orbison, Buddy Knox, The Fireballs, Virgil Johnson (of the Velvets), Tanya Tucker, the Gatlin Brothers, Dan Blocker (Hoss Cartright of Bonanza), Jimmy Dean, Mac Davis, Barry Corbin (actor), G.W. Bailey (actor), Snuff Garrett, Bob Montgomery, Sonny Curtis (songwriter), and of course, the original Crickets (Jerry Allison, Joe Mauldin, and Niki Sullivan among many others. 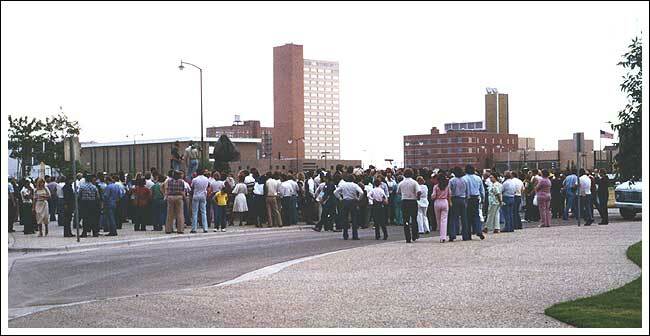 A large crowd was in attendance on September 5, 1980 when the statue was unveiled.